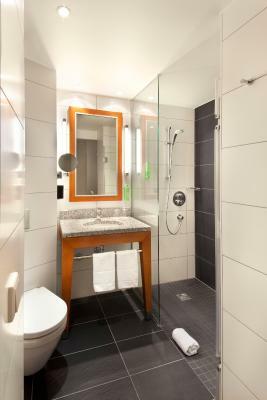 Lock in a great price for Holiday Inn Berlin-Alexanderplatz – rated 8.5 by recent guests! Hotel was very clean and staff also helpful, great location.. recommending everybody to stay in Holiday Inn Alexanderplatz. Check in was good I forgot the name of the lady she was extremely helpful and nice touch up in the room from the front office Manager Sebastian Brill . Very easy to get to from Schonefeld airport. Clean and no issues with check in or check out, reasonable price. Because my girlfriend and I was celebrating 2 years together, Andrea left us a chocolate cake which was delicious. Very heart warming to have a nice welcoming. 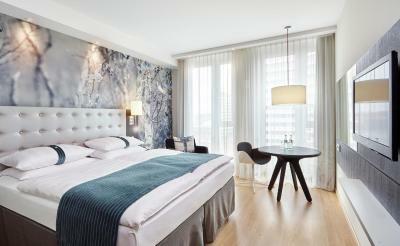 The location is perfect, 3 min walk from Alexanderplatz train station. 3-4 min walk from Alexa shopping center and Saturn store. Variety of places to eat, variety of cuisines. The stuff are very helpful. The room was very clean everyday. The shower pressure and water temperature was great. The hotel works with a good taxi services, comes at time and it is very easy to order a taxi for our desired time. Great breakfast. Good location. Reasonably close to the train station -- convenient access to the attractions. The location perfect, the staff was helpful, the design is pleasant. 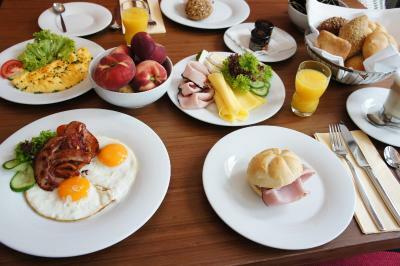 Good location, very comfortable, good service, and the breakfast very good. Thanks. 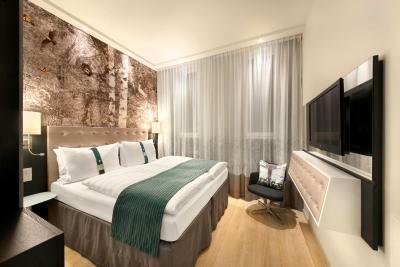 Holiday Inn Berlin-Alexanderplatz This rating is a reflection of how the property compares to the industry standard when it comes to price, facilities and services available. It's based on a self-evaluation by the property. Use this rating to help choose your stay! 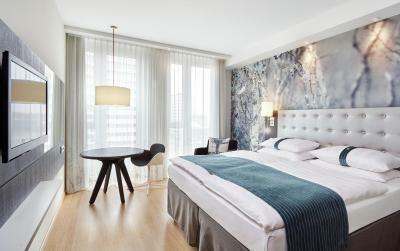 Set in the heart of Berlin’s trendy Mitte district, this modern hotel is just a 2-minute walk from Alexanderplatz. 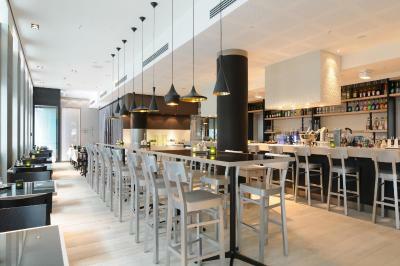 It offers a restaurant, gym, free Wi-Fi and free landline calls to the US, China and 17 European countries. 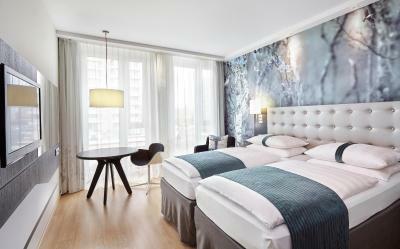 The soundproofed rooms at Holiday Inn Berlin Alexanderplatz feature stylish interiors with contemporary furniture. 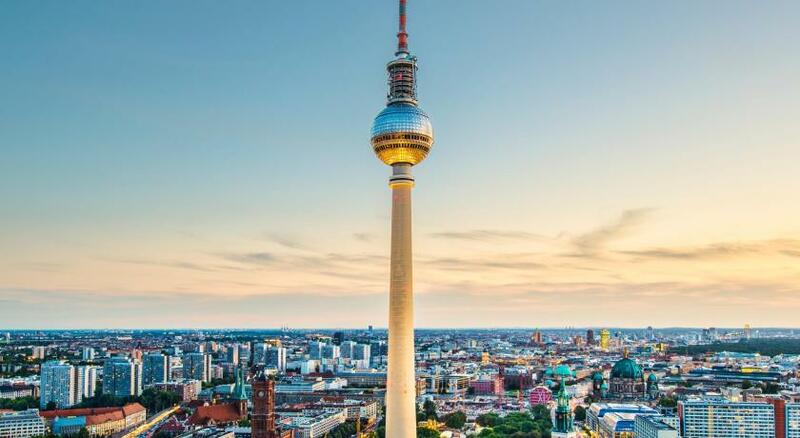 A satellite TV with 3 free Sky channels, and hot drinks facilities are provided in every room, and some rooms offer views of the iconic TV Tower. 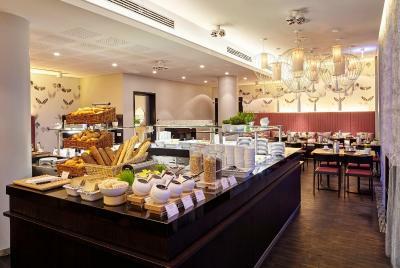 Each morning a hearty buffet breakfast is served in the hotel’s welcoming restaurant Vilo. Guests can also sample a wide variety of international cuisine in the La Maison de L´entrecôte restaurant. 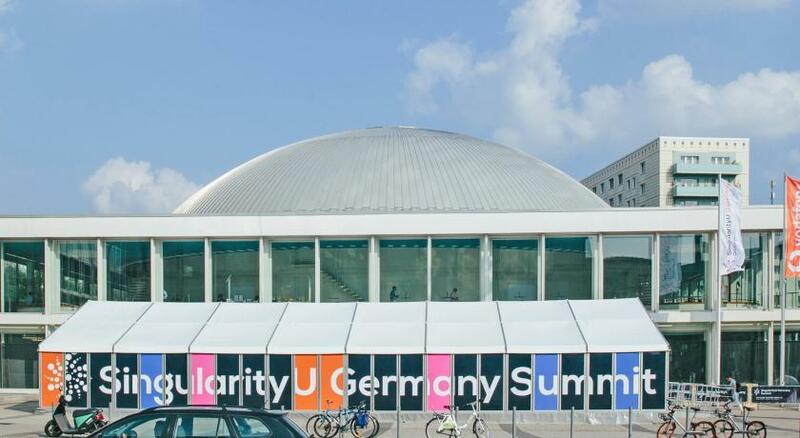 Visitors will find sights such as the Museum Island, Berlin Cathedral and Jewish Museum are within a 10-minute walk of the Holiday Inn. The shops, bars and boutiques in the Hackescher Markt district are also 0.6 mi away. 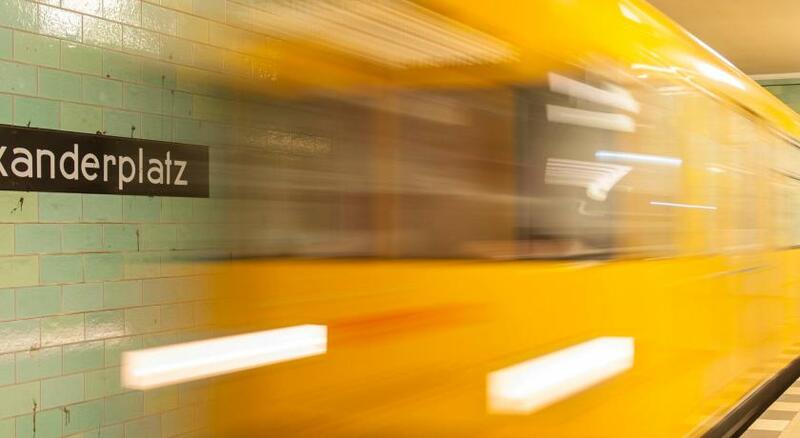 Just a 2-minute walk from Alexanderplatz S-Bahn Train Station, guests enjoy direct train connections to Berlin Schönefeld Airport and express bus connections to Tegel Airport. 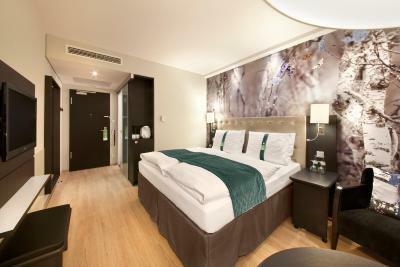 When would you like to stay at Holiday Inn Berlin-Alexanderplatz? This spacious room with stylish interiors features 3 free Sky satellite channels, free WiFi, a Tassimo coffee machine, a mini-bar with a free bottle of water and a private bathroom with complimentary toiletries. Spacious room with stylish interiors features 3 free Sky satellite channels, free WiFi, a Tassimo coffee machine, a mini-bar with a free bottle of water and a private bathroom with complimentary toiletries. 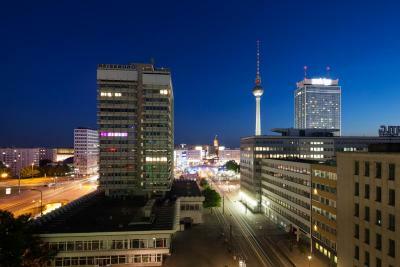 Includes a private balcony with views of Alexanderplatz Square from the 10th floor. These rooms offer views of the inner courtyard or the TV Tower, as well as a flat-screen TV, free WiFI and tea and coffee facilities. This room offers much more space than the Standard category, as well as views of the inner courtyard or the TV Tower. It includes a flat-screen TV, free WiFi as well as tea and coffee facilities. This room offers views of the TV Tower and much more space than the Standard category. It includes flat-screen TV, free WiFi as well as tea and coffee facilities. 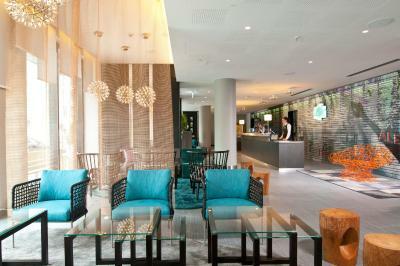 House Rules Holiday Inn Berlin-Alexanderplatz takes special requests – add in the next step! Holiday Inn Berlin-Alexanderplatz accepts these cards and reserves the right to temporarily hold an amount prior to arrival. The reception is not good, they didn't know whatever your answer, like a restaurant and atractions to indicate or booking. The attention is not good, without a smile and for the first time, my credit card was paid before my arrival at Holiday Inn although I spent four days there. Nice location near to Alexanderplatz. Easy to travel everywhere from hotel. Amazing staff that went above and beyond. Very nice rooms and the location is fantastic. TV channels weren't great and advertised Sky Cinema didn't work. We now know all about the Israeli election from CNN. 😕 Also no sugar left for coffee on day 3... Not hard. Location was good and staff were excellent and very helpful, Andrea especially. The sides of the bed were as high as the mattress so it was very uncomfortable getting into and out of the bed. I got an upgrade, had a beautiful room, everyone was super friendly. Coffee, Sugar, Milk was supplied in limited quantity. To be precise 2 each of creamer, sugar and coffee, when guests were two!!! Very clean room, recently renovated. Excellent location. Helpful staff, you can rent bikes directly with the hotel. Good breakfast. The bathroom door should lock to give more privacy. The room was very small, (way too small) and we took the executive one. No mini bar in the room. Only one small window can be opened. 25€ for every hour of late check out. The location was perfect, 4 minutes walking from alexanderplats train station, 2 minutes to the U (metro) and to the tram. Shops, restaurants and everything needed. The bad was very comfortable.